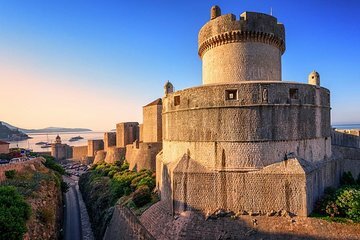 Breng een ochtend door met het ontdekken van de kraaiende juwelen van Dubrovnik - de middeleeuwse muren en de historische binnenstad die op de werelderfgoedlijst van UNESCO staan ​​- tijdens deze 3 uur durende wandeling. Wandel langs de Stradun, de belangrijkste promenade van de oude stad, bekroond en volgord door Orlando's Column en Onofrio's Fountain. Geniet van oude monumenten zoals het Franciscaner klooster en de kerk van St Blaise voordat u afdaalt in zijstraten met winkels, restaurants en andere architectonische hoogstandjes. Sluit vervolgens uw tour af met een wandeling langs de stadsmuren voor een prachtig uitzicht op de Adriatische Zee. excellent tour, enjoyed every bit of it. saw things i would not have found on my own. We did not have a good tour guide on this tour unfortunately. Ivana could have done a better job as there were only 3 of us in this tour. I thought small is good but it did not turn out that way. She was not too enthusiastic and there was not much been shared about the history of Dubrovnik. She was nice but lacks the passionate and content! This was by far one of the best Viator tours that we've taken, worth every penny! Hama, our guide, provided us with an overview of Dubrovinik's history by sharing personal experiences. He took us to parts of the city that a normal tourist wouldn't experience. We went to 5 different locations for wine, antipasto, main course , desserts, and ending up in a cave wine bar. The food was amazing. We went back the next night to eat at one of the restaurants again. If you are a foodie, DONT miss this tour! Great tour. Wonderful guide. Highly recommended. Excellent communications from Viator re meeting point. Tour Guide exceptional and very passionate about the history of the area - the tour of Dubrovnik very interesting plus very busy! on the Tour of the Walls with the same guide it was a very small group and we received a very interesting and informative tour which was way beyond what we expected - the guide did not rush us - in fact went over and beyond by allowing us time to have a coffee on the city walls which was lovely I would certainly recommend this trip to make the most of the Dubrovnik experience. This was a really enjoyable and informative tour. The guide Nerena was very straightforward about even the painful aspects of the war. The walls are beautiful and so well maintained. In spite of the crowds I highly recommend this tour. A real plus was that each person had a small receiver to wear with 1 earplug. Therefore we didn't have to struggle to hear what our guide was saying. we found this trip to be very superficial. AFter being told the history of Dubrovnik for the first 10 minutes in a side alley, we proceeded into the old city. WE were shown from the outside some of the cathedrals, government buildings etc but were never taken into the buildings to see or learn more about them. We were told we could do that on our own. . When we walked the old walls there was no commentary. IT was a total waste of time and money we did not need to follow someone around the walls. We have been on many city walking tours and usually there is too much information to digest. This was quite the opposite and very disappointing. Knowledgeable tour operative, v friendly and a lovely city. We took tour guides advised and walked the walls later in the day as it was raining in the morning and could possibly of been slippery. Great guided tour . The guide was exceptional , gave us lots of insights into the history of Dubrovnik both old and recent. Only request is that Elite tours schedule the walk on the walls earlier in the day to avoid midday heat.. Informative and enjoyable. Make sure you wear comfortable shoes and that you're protected from the sun as up on the walls it's impossible to find shade. The tour was good value for money. Our tour guide Lydia was interesting and spoke excellent english. The back streets were fascinating and the views from the walls are amazing. A great tour of the city, we were certainly ready to relax when it finished.